A healthcare regulator has decided that a notorious benefits assessor will not face any disciplinary action over allegations of dishonesty, even though his former employer admitted that he lied in an assessment report. Paramedic Alan Barham still faces being struck off for comments he made to an undercover reporter while working for the government contractor Capita, which were aired in a Channel 4 Dispatches documentary last April. But the Health and Care Professions Council (HCPC), which is investigating Barham’s actions, has decided that separate allegations that he lied in a report he wrote after assessing a disabled woman’s eligibility for personal independence payment (PIP) will not be dealt with by a disciplinary hearing. The conclusions reached by the council will add to concerns that regulators are failing to act when they receive complaints from disabled people that healthcare professionals have written dishonest reports after carrying out face-to-face PIP assessments. Following a two-month investigation, Disability News Service (DNS) has collected scores of cases of disabled people who claim that PIP assessors like Barham lied repeatedly in reports produced for the Department for Work and Pensions. 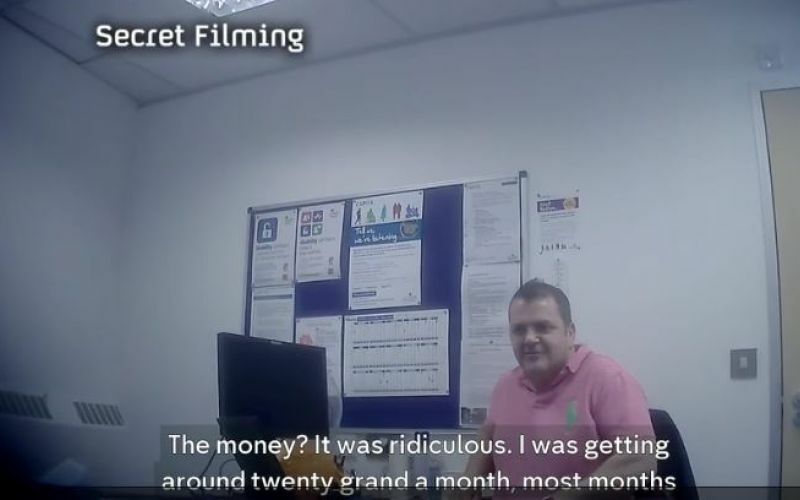 Undercover footage from the Dispatches programme (pictured) showed Barham admitting that he sometimes completed his PIP assessment reports before even meeting the claimants. He also told an undercover reporter that he could usually “completely dismiss” what he was told by PIP claimants, and made offensive comments about an overweight claimant who was unable to carry out her own personal care. After watching the programme, two disabled people who had been assessed by Barham lodged complaints about his behaviour, based both on the documentary and on reports that he had written following face-to-face assessments of their entitlement to PIP. An HCPC investigating committee has now concluded that the comments Barham made in the documentary are serious enough for him to be found guilty of “misconduct and/or lack of competence” if a disciplinary panel finds them proven. But the committee has also decided that allegations about the two PIP assessments carried out by Barham – which were not part of the documentary – are not serious enough to merit findings of misconduct and/or lack of competence, even though Capita has already concluded that Barham lied in one of the assessment reports. The committee concluded that the allegations concerning lying and other failings in assessments “could be considered to fall short of the expected standards of a Paramedic” but “do not, in the Panel’s view, constitute misconduct and/or lack of competence”. David Nicholls, from Northampton, the husband of one of the PIP claimants, has told DNS of his anger and frustration at the way HCPC has dealt with the case. DNS has seen Capita’s response to his complaint about the assessment report Barham wrote following an assessment of his wife, Jacqueline, in March last year, a month before the Dispatches documentary was screened. As a result of the assessment, she was found ineligible for PIP. It was only after the documentary was aired and DWP agreed to allow her to be reassessed that she was granted the enhanced rate for both the daily living and mobility components of PIP. In his report, Barham repeatedly stated that what he was told by Jacqueline Nicholls was not backed up by the tests he carried out during the assessment. But David Nicholls said Barham had ignored the impact of his wife’s brain injury on both her physical and mental functioning, including her seizures, her confusion when asked too many questions, the lack of feeling in parts of her body, her memory problems, and her tendency to get lost when on her own. Barham reported instead that she could plan and follow routes, understand complex written information without any help, and make her own budgeting decisions. Nicholls said: “He has misled people with the findings in his report in the worst possible way. He said that the effect of dishonest assessors like Barham on disabled people was “devastating”. He said he was “very upset” by the HCPC decision, which he said showed that it was “letting down any person who feels they have been badly treated or assessed. An HCPC spokeswoman said: “We can confirm that complaints against Alan Barham are currently being investigated through our fitness to practice process and an allegation pertaining to these matters has been referred to the conduct and competence committee. “However, due to the ongoing nature of the investigation and our duty of confidentiality to all parties involved it would be inappropriate for us to comment any further at this stage. She later added: “I can confirm to you that [the Dispatches claims]are the only allegations going forward to the final hearing, they are now the only two allegations in the public domain. “Essentially, this means [the allegations concerning the two PIP assessments]will not be further considered. DNS has approached Barham for a comment, but he had not replied by noon today (Thursday).